Made to blow serious gamers away, the MSI GeForce GTX 460 Cyclone OC treats your eyes to incredible images thanks to extreme 725 MHz overclocking. 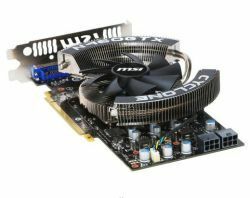 The GeForce GTX460 Cyclone OC by MSI boasts 1 GB of GDDR5 RAM to considerably enhance frame rates in the latest video games. It's optimised for Windows 7, and is equipped with DirectX 11 support for backwards compatibility, CUDA for hardware acceleration, and Physx for lifelike, interactive graphics. That's not all though! The GeForce GTX460 Cyclone OC GPU even has a mini-HDMi socket for watching films on your computer with the quality of an HD TV.